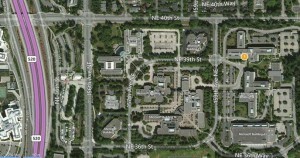 This is an invitation to our next MicroHAMS meeting coming up Tuesday, January 21st, 2014 (always the 3rd Tuesday) at 6:00 PM at our NEW 2014 location at Microsoft Building 35 (see this map or the picture below), Conference Room 3561. 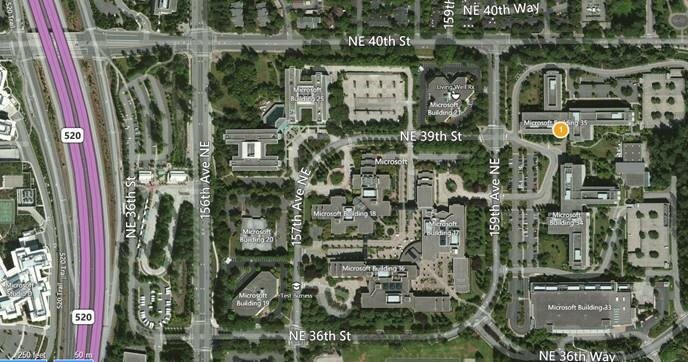 Building 35 is near the intersection of 159th Ave NE and NE 40th St on the southeast corner. Parking is available near the front of the building at ground level. 146.58 MHz simplex will be monitored for anyone who needs help finding the site or for access to the building. (Monitoring is done with handhelds, so range is limited.) The phone number for the conference room is +1 (425) 707-8182 for those who are not yet licensed or do not have a radio. If you’re running late and are locked out, please call us on the radio or phone. We’ll send someone to let you in. PLEASE NOTE: Anyone who is not currently badged for unescorted access to Microsoft buildings MUST be escorted into Building 35 and to conference room 3561 by a badged MicroHAMS member. Do NOT under any circumstances attempt to “tag” onto or “tailgate” Microsoft employees entering Building 35. Please congregate about five minutes before the meeting at the front entrance of the building, which is where the orange circle with the number 1 appears on the map picture above. This entry was posted in General Meetings and tagged club meeting. Bookmark the permalink.